The quantified self movement often focuses on measuring data to help us improve short to medium length goals. If we take a step back and then increase the range of measurement based on our life expectancy and work backwards we can use a very different lens to help modify the behavior of our lives. The thought behind this came to focus for me after reading Beh Huh’s post whereby he provides specific values for how many activities he will enjoy for the remainder of his life. He does this by determining his life expectancy and past patterns. This is something we can all do fairly easily and when presented with this information we may immediately realize that we’re not happy with what we find. Between today and the day I die, I have 5 more home buys left. I have 19 car purchases left. I have 1,368 bottles of wine left to drink. I have 46 new countries left to visit. I have 8,376 dinners left with my wife…These numbers don’t make me happy. They are morbidity made real. They are a harsh reality opposed to the vague, positive, seemingly infinite notion of the future I used to have. But my overly definite count of life that remains is just as real of a construct as a dreamy, foggy future. The quantification of life that remains is a huge dose of reality. As we get older it’s easy to fall into a routine only to look up and realize we’ve spent several years spending time on activities in a specific pattern. If we take some time to define the activities or behaviors we’d like to increase and decrease and find a way to measure them easily over time, we should be able to be more conscious of them making it easier for us to try and change our patterns. 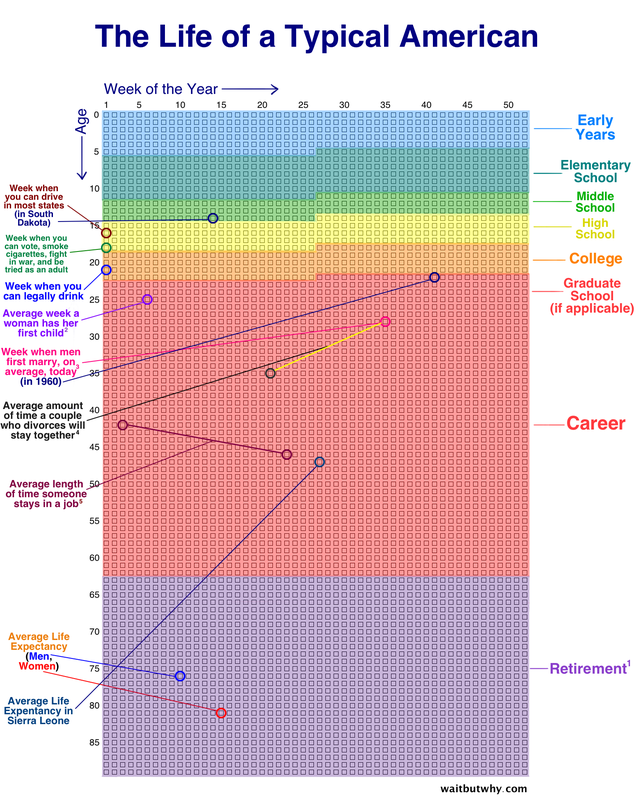 One such visualization that I came across that could be modified for this purpose, that also provides a high level example of just how finite our lives are is the Life in Weeks grid. I came across not one but two posts that echo a theme I’ve been seeing quite a bit lately encouraging us to invest in life experiences more than material goods. I agree with this mantra want to spend more time during the remainder of my life traveling. By tracking how much (or lack thereof) I travel and estimate the remaining opportunities to do that in the future it might prove a strong motivator to change my behavior. Probably the best example of this type of tracking and reporting that makes it pretty clear to reflect on are the Feltron Annual Reports by Nicholas Felton. Creating these types of reports could prove difficult but this year Nicholas has released the Reporter App which aims to give us this ability. Another app I came across which should offer similar capabilities for iOS is ATracker. TimeTune is another app with similar functionality and the only one for Android that I’ve found. These are just a few examples of tools that may help us consider a much larger view of our lives activities to help us determine if we’re going down the path that we want to. This is a theme I’ll want to explore further and would love to learn about new apps and methods people use to see this bigger picture. I welcome your comments or feedback below.